Twelve-year-old Emily hobbled down the stairs, rubbing her tired hazel eyes. She collapsed onto a chair in the breakfast room, clutching a book in her hand. “How was The Lake?” an old man asked, nodding toward the book. Wispy gray hair adorned the sides and back of his head like a garland, but the top was smooth and shiny as a crystal ball. “Is it really good for Emily’s health to stay up so late reading these books?” questioned Emily’s mother, her pretty brownish-green eyes the exact image of Emily’s. Frowning, Emily’s mother poured a bowl of cereal for her daughter and handed it to her. “I got a new shipment of books yesterday, Emily,” Mr. Larson said excitedly. Emily suddenly perked up and her eyes sparkled like diamonds. Her cheeks, dusted with freckles like cinnamon sprinkles, glowed with excitement. Emily and her grandfather were walking hand in hand down the sidewalk. Orange, red, and yellow leaves twirled in the chilly November breeze like beautiful ballerinas. Emily’s mittened hand covered her icy nose as they briskly traipsed through the streets until they reached Mr. Larson’s Library. Unlocking the glass door, Mr. Larson swung it open and ushered Emily into the building. The cozy, one-room library was filled with hundreds of books on beautiful, smooth oak shelves. Behind the counter sat a large cardboard box. Emily imagined herself riffling through the pages of each one, smelling the crisp scent of brand-new books. “Pull out the scissors from the desk drawer, Emily, so we can open this,” Mr. Larson said, kneeling down beside the box. Pulling open the drawer, Emily’s hands closed around the scissors. Then she saw it. It was a stunning, maroon leather-bound book with gold lettering on the cover. The pages did not look new, for they were torn in some spots, yellowed, and smelled musty. The title was simply The Story. Emily thought she had never seen a more beautiful book. “I’ve never seen this book in your library before. May I preview it?” she asked her grandfather hopefully. “Magic books can be very dangerous,” cautioned Mr. Larson. “I cannot allow any harm to come upon my only grandchild.” There was a slight warmness in his voice, but at the same time Emily heard an authoritative strictness in it, too, so she didn’t say another word about The Story. That night, Emily settled down in her bed to read the pile of books she had chosen from the box at her grandfather’s library. The small tower included novels from her favorite author, chapter books from budding writers, and so on. But none of those interested her, for underneath the heap of books sat The Story. It had taken some careful maneuvering to sneak it into her selection of books, but she had succeeded, and as she opened up The Story, the trouble she had gone to seemed worth it. The Story was the most amazing book she had ever read. Somehow, it combined all styles of writing: fiction, drama, comedy, and more, into one pleasing paragraph after another. She devoured the thick book, and soon forgot where she was. The way the words were woven together and the way the author described settings and characters were magical, but the true magic of the book was not yet revealed to her. Her lamp glowed softly like a firefly, penetrating the pitch-black night outside. Rain pelted down on the roof and the harsh wind whipped the tree limbs around, the boughs making a scraping noise against the window. Eerie shadows from the gnarled, clawing arms of trees cast menacing silhouettes on the walls. It was midnight, and Emily had fallen asleep on her bed, her auburn hair spread out on the soft pillow. The Story sat beside her, the light shining on its pages. This is where the magic began. 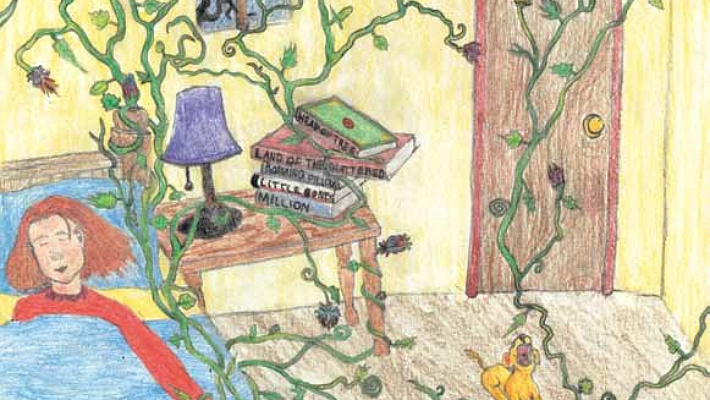 Wiry, leafy vines began to grow from the pages, coiling around each other like a snake. They climbed up the walls, cloaking the white paint in dark green masses. 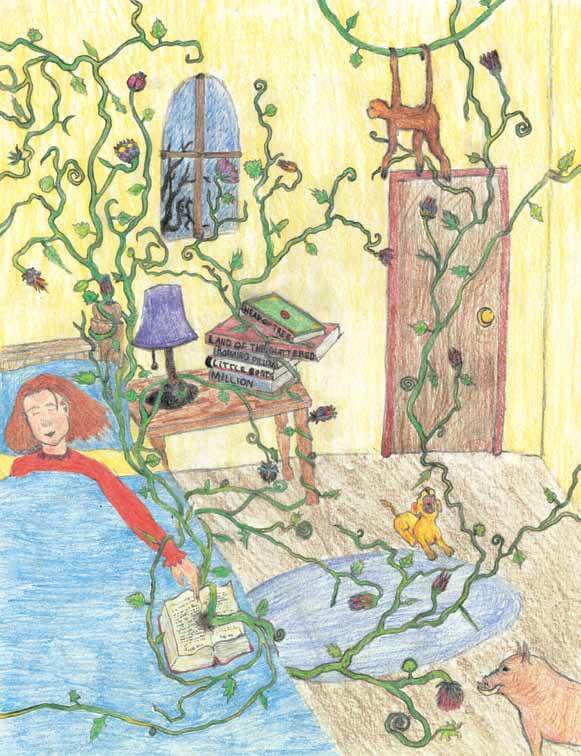 More plants, including exotic flowers and tiny saplings, began to sprout from the pages, crowding to move out of The Story and into the real world. But plants were only the beginning of the problem. The array of botany was followed by various species of animals, including lions, tigers, and even a few monkeys. By this point, Emily could not have stayed asleep with the grunts, roars, and other noises that filled the air. When she awoke, her mouth dropped open and her face went pale as she saw what was before her. Her eyes swept the room, looking for the source of this stampede of nature, although she already knew the origin. The Story was the only possible thing that could have caused this havoc, and when she looked down at the book, she saw she was right. More plants and animals were erupting from the spine like a volcano, adding more chaos than there already was. Emily’s stomach knotted up in fear, her dread mainly caused by the ferocious-looking big cats. But her anxiety of the punishment for disobedience propelled her on, assisting her to gather up enough courage to slip out of her cocoon of blankets and onto the carpeted floor. 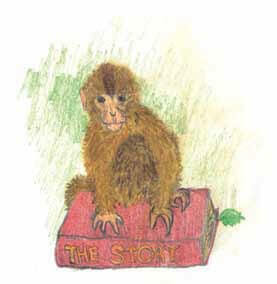 Bravely marching up to a monkey, she ordered in a somewhat quivering voice, “Get back in the book.” The little primate yanked her hair and sped away. Emily huffed angrily. The little rascal seemed to be laughing at her! Trying not to show her frustration at how uncooperative the monkey was, she concentrated her effort on other things. Emily desperately tried to pull the vines off the wall, but they seemed to be tugging against her, leaving painful red marks on her hands. She attempted to carry a baby lion back into the pages, despite her fear. The coarse fur of the wild feline brushed against her hands and she pushed, shoved, and hauled the big cat beside The Story, but he simply walked away. Each plan she tried thereafter that didn’t work made her feel more and more discouraged. Her grandfather was constantly on her mind as well. I will get in so much trouble if he finds out, she thought. She remembered his caution from earlier that day: “Magic books can be very dangerous.” He had warned her about the book. Now it was too late. The door suddenly swung open. There stood Mr. Larson. Despite her worry about the punishment she would receive, Emily had never been so grateful to see her grandpa. He calmly strode to the bed and picked up The Story. Emily watched with great interest as he carried the book to each plant, and individually tore each from the wall or ground with his strong hands and placed it back into the pages. They disappeared. As the plants began to disappear, so did the animals. They walked to the book themselves, as if knowing they had to go back. By simply putting a paw onto a page, they were whisked back into The Story. In only five minutes Mr. Larson had swiftly and easily restored the room back to normal. Emily sighed with relief but then remembered she had a consequence to face. She braced herself, but her grandpa simply closed the cover of the book and left the room without muttering a single word. As soon as he left, thoughts were swimming in Emily’s mind. Why didn’t Grandpa punish me? How did he know I needed help? What would have happened if he hadn’t come? She sat on her bed, pondering these and other questions, until the sun began to peek over the horizon and she finally fell asleep. The next morning, Mr. Larson, Emily’s mother, and her father were sitting around the breakfast table, drinking coffee and chatting together. “Good morning, Emily,” her mother said as the preteen girl sat down. “Why, you look exhausted!” She frowned at Mr. Larson. “She really needs to stop reading books at night. I am telling you, it is bad for her health!” Emily’s mother and father were obviously unaware of the bizarre and terrifying situation that had happened the night before. A short time later, Emily and her grandfather sat in Mr. Larson’s Library, each lost in their own thoughts about the situation last night. Silence blanketed the library, and except for the ticking of the clock on the wall, all was calm. “How did you know I had the magic book? How did you know I needed help? Why didn’t you punish me?” Emily suddenly asked, breaking the tranquil peacefulness that hung in the air. 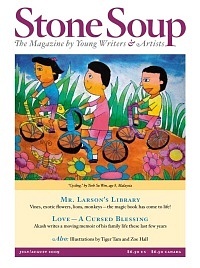 Even though no mention had been made about him, Emily knew the little boy in the story was Mr. Larson. Emily’s grandfather had obviously been through the same experience as a child. That answered the first two questions. “But why didn’t you punish me?” Emily asked. “Will you ever read a magic book again?” Mr. Larson inquired. “Then do you need a punishment?” Mr. Larson queried. “But I disobeyed you,” Emily pointed out. “I’m not one for punishments, I suppose,” Mr. Larson replied, shrugging. They were silent again for a few more minutes, but then Emily had another question. “Why do you still have The Story?” she wondered. “Perhaps so my granddaughter can develop an appreciation and respect for magic,” Mr. Larson said, giving Emily a smile and a wink.